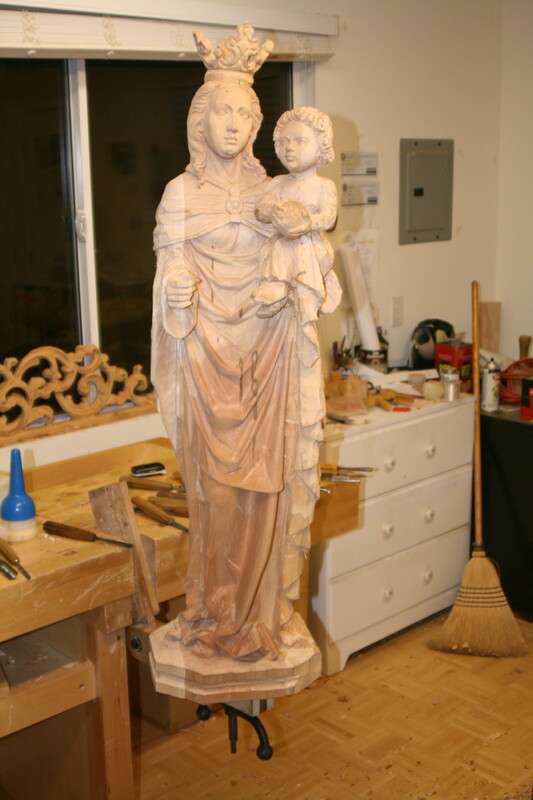 Mike is a woodcarver and would like to share his experience in working in a Master Carver's studio and also some of his works. If you had a hobby, can you picture yourself working in the studio of a Master of the craft? Well I am fortunate enough to be one of those people who has been privileged to work in the studio of a Master Wood Carver. Let's get one thing clear — I said work in the studio not work with the Master. There is a difference. As far as his profession goes, I'm not even a novice. Jorg Hummel is a Master Carver from Bavaria and has been carving for more than 40 years. 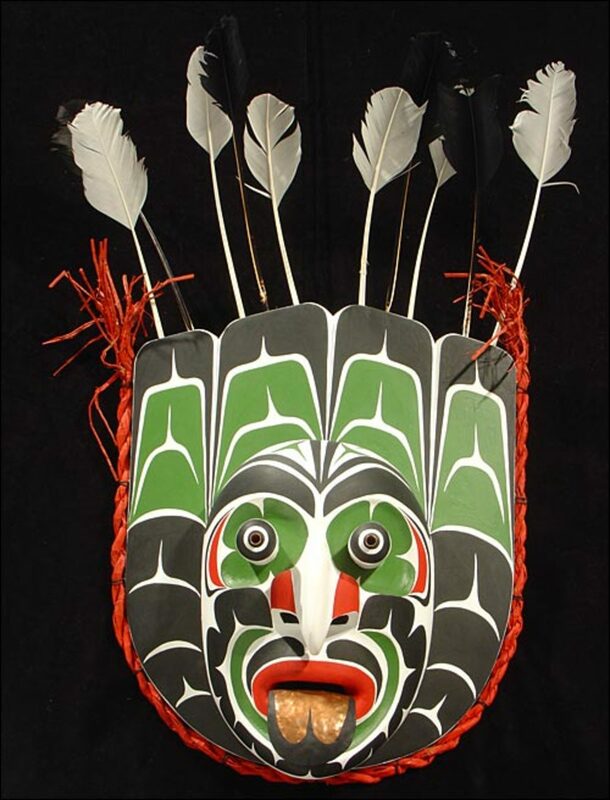 He has an earned the title of Master Carver, which is equivalent to a master's degree in the craft. 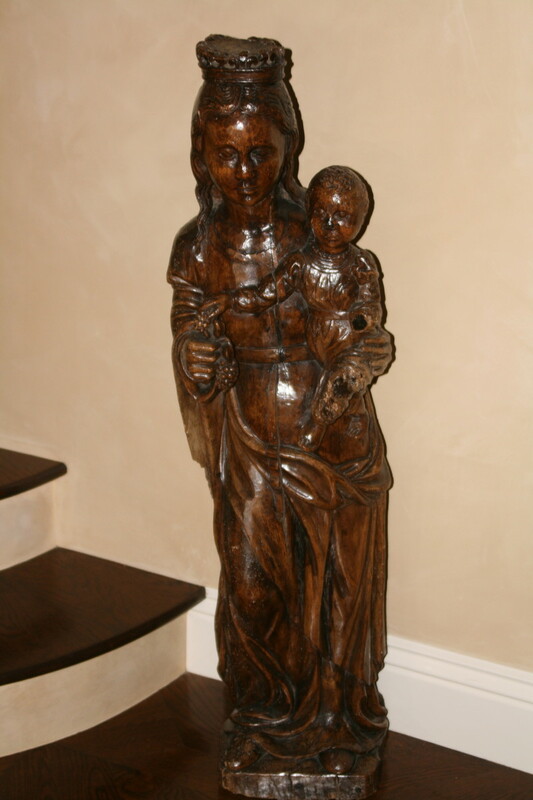 Among his many types of carvings, he specializes in alter piece restorations for European Churches. 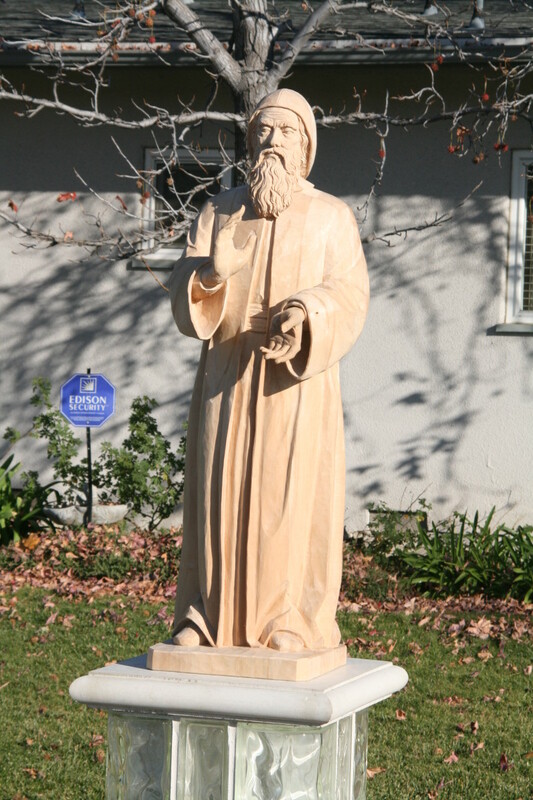 His woodcarvings are sent to Europe to be finished to look like marble. Watching him work in his studio is like watching Michaelangelo or Leonardo DiVinci working on their masterpieces. I first met Jorg Hummel about seven years ago. 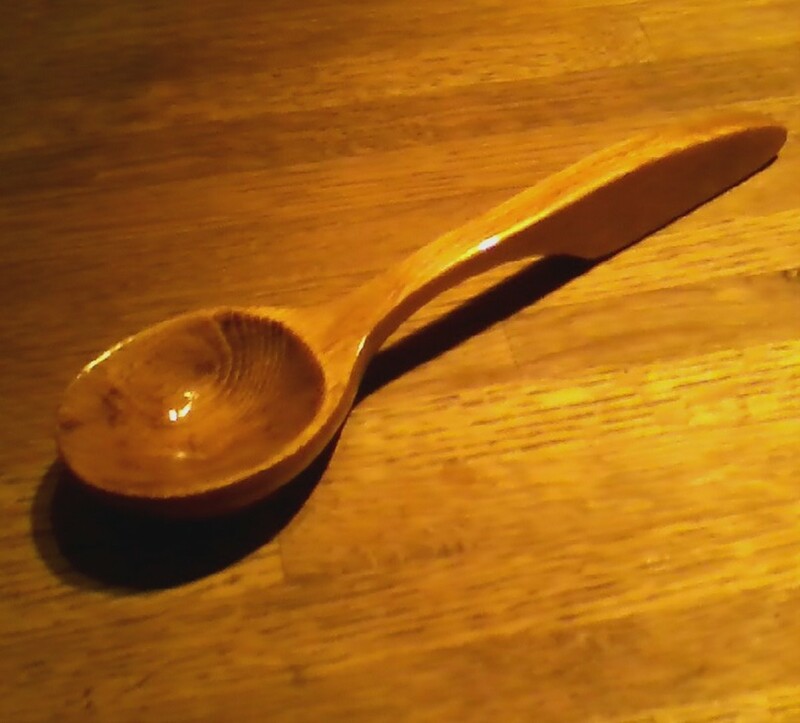 I joined a woodcarving club because I carved a simple dog and boot on my own, but I wanted to learn more. The first night I attended the club, at about half-way through the meeting, a man walks in with carving that appeared to be something out of the renaissance era. The picture above was taken that night. It is a carving of Jesus at the age of 13. He used an 11 year old boy as the model. Of course it is an artist's conception because, there are no pictures of Jesus at that age. How Did We End Up in a Master Carver's Studio? At this point, you may be wondering, how our club ended up meeting in a Master Carver's studio? To make a long story short, our club wandered around for many years, like gypsies, from one facility to another. During this time, Jorg would always come to visit us and show us his latest work. One day, out of the kindness of his heart, he asked us to do our carvings at his studio. Needless to say, we were delighted. The rest is history. The remainder of this article shows samples of Jorg's work with brief descriptions of each piece, transcribed from his narrations. 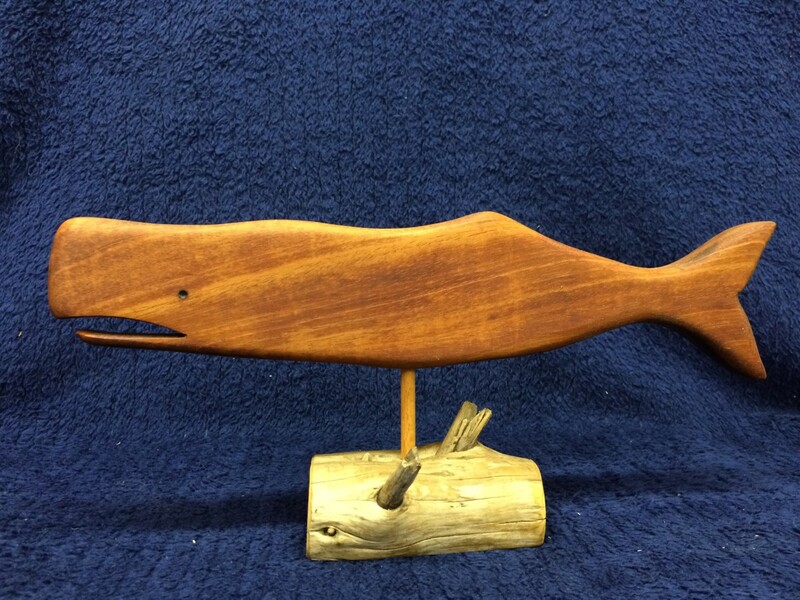 Caution: If any of you are woodcarvers, this may make you want to throw your tools away! A monk who lived in Lebanon in the 40's and 50's. People believed by touching him, they would become healthier. 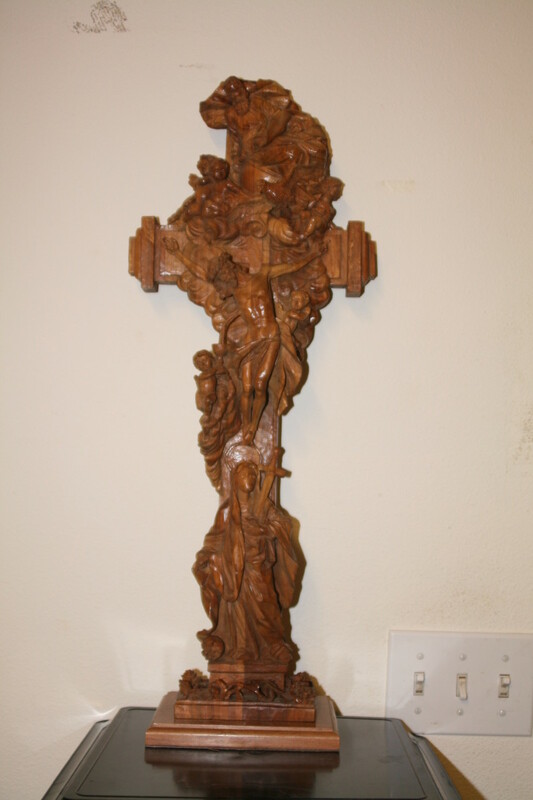 A cross made from German Walnut with many religious symbols on it. 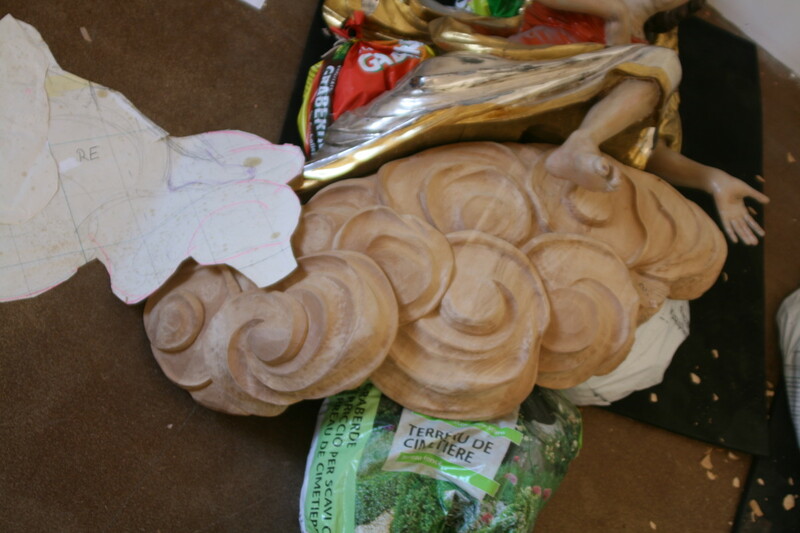 Clouds made in the Baroque style for left and right sides of an alter. 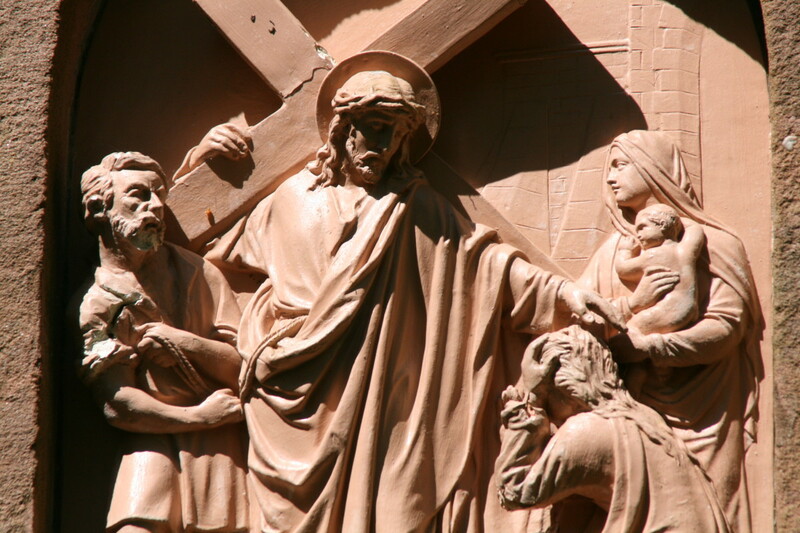 One of the 14 terracotta stations of the cross in Munich Germany that were damaged by the NAZIs during WWII. Jorg was called in to repair all of them with his carvings. 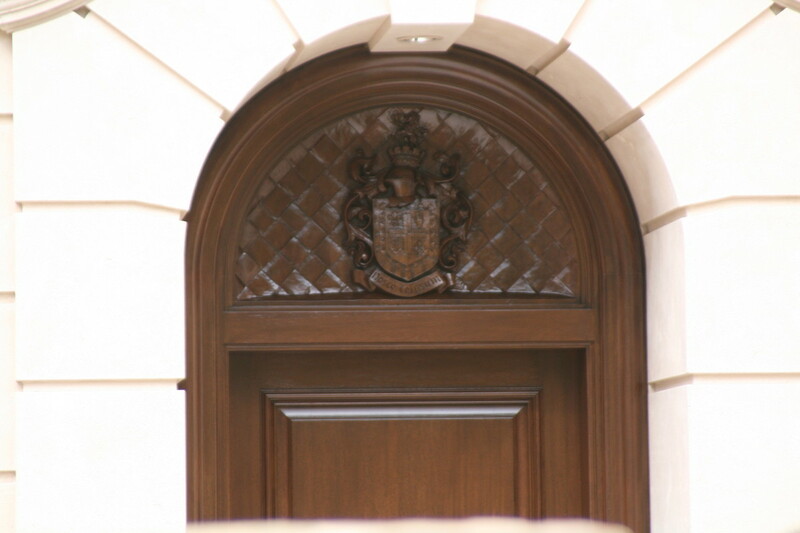 Coat of Arms over doorway. Jorg's version of the Maddona above. 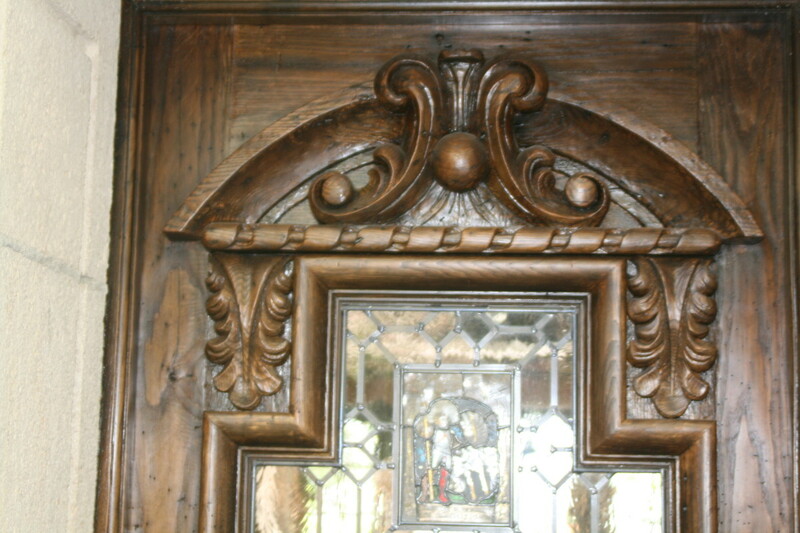 A Spanish Baroque style door. The wood was imported from Europe. 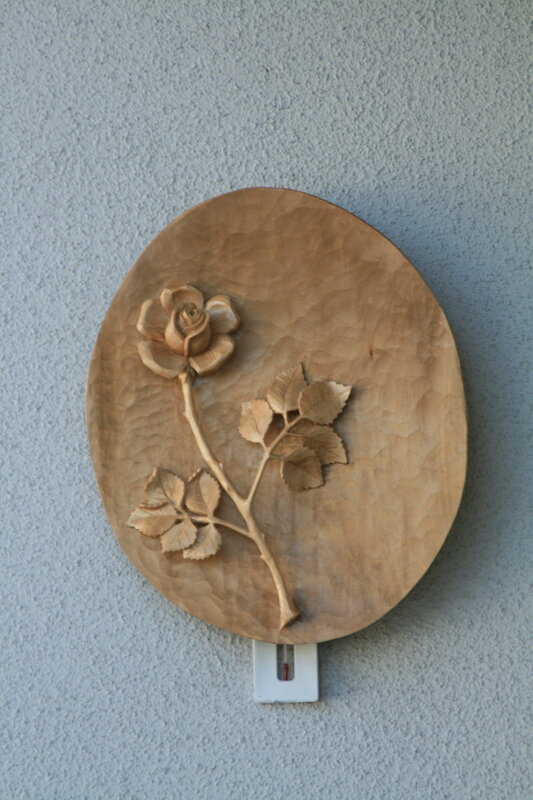 A bowl with a rose all made from one piece. It was made for a man's Aunt who lives in Switzerland. Note that the stem is elevated. A Madonna whose name is Immaculate. 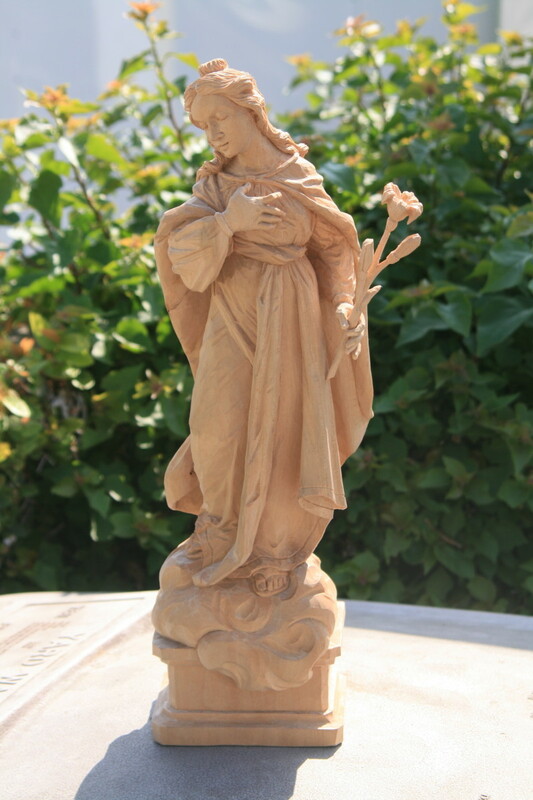 The rose is symbolic of the Virgin Mary. Watch this video to see more of Jorg's work. Thanks for the comments Glen. MHiggins: Thanks for dropping by and your comments. His assistance came from Germany to help him with a big project and she is almost as good a carver as he is. Excellent hub! I have a deep appreciation for woodcarving on this level. Your hub was well written and descriptive. Voted up. Hi Jaye: Every time we step into his studio, We feel privileged to watch his work unfold before us. What is really nice is with all that talent and genius, he does not have a pretentious bone in his body. 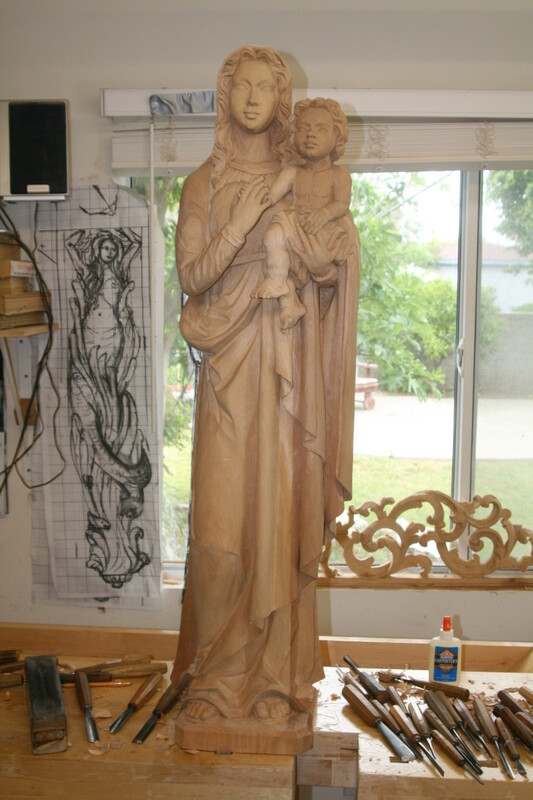 He is now working on a full size crucifix of Jesus Christ that will be one of the altar pieces in a Korean church in Norwalk California. Thank you for your votes. Nell Rose: Thank you so much for dropping by. Yes I feel privileged to even be in his studio. He is currently working on another life size crucifix which is a work in progress. I'll add those pictures to the hub. suzettenaples: You are welcome. I'm glad you enjoyed Jorg's work. 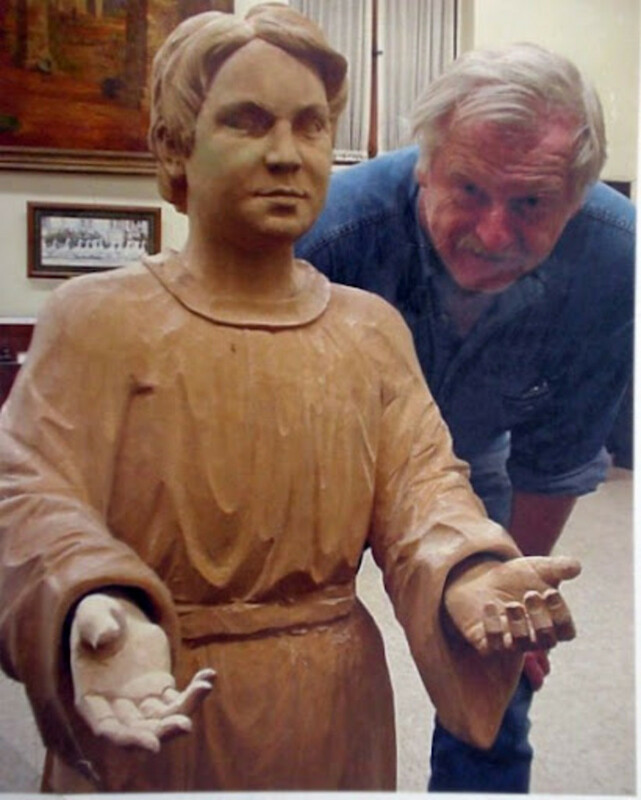 He is currently carving another full-size crucifix for a church. I have pictures of his work in progress. I think I'll post it on this hub page. Thanks for dropping by. What an exciting experience! How fortunate you are. I have lived in Germany and I love the woodcarvings from there and I really appreciate the art! He is a magnificent carver and his works look like they are live! Thanks for sharing this wonderful experience with us! StephanieBCrosby: He is currently working on another life-size crucifix. It sits in his driveway and is laying prone on saw horse. Even though it is still in the rough stages, I can see the form of the piece. He is truly awesome and I feel priviledged to be in the company of person with this level of talent and genius. Thanks for stopping by. This hub and the work displayed in it are awesome. I cannot believe he works in wood like this. My husband and I "converted" our garage into a woodshop. But nothing really good comes out of it. 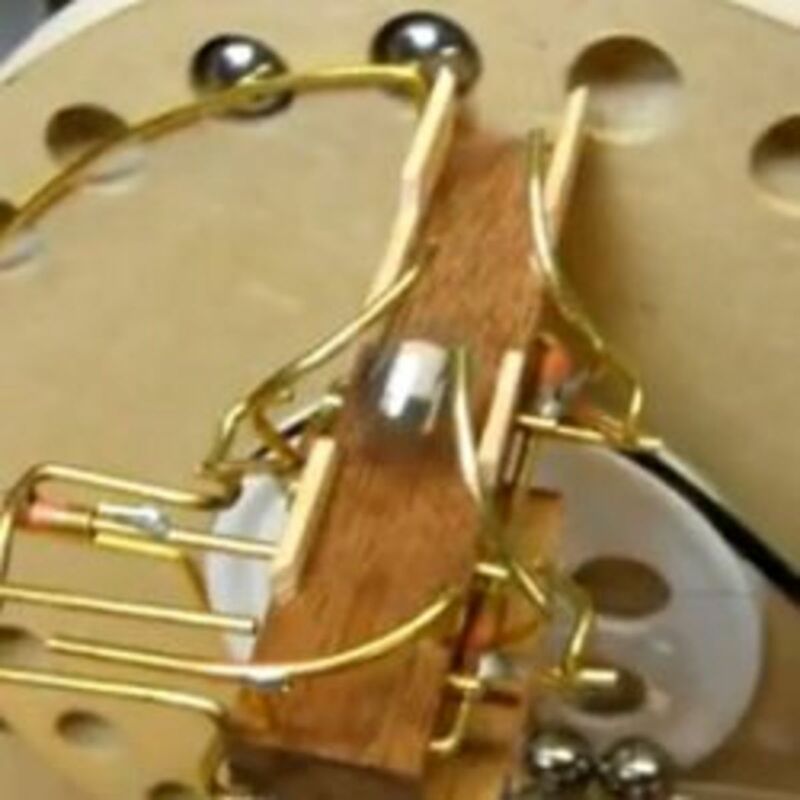 I can make Christmas ornaments and picture frames, and my masterpieces were a wobbly table and a very sturdy wagon that now (without its wheels) is serving as a plant holder for various herbs. Brandon Tart: I'm glad this has inspired you. I'm looking forward to seeing your work. As an artist, I must say, I think seeing these has given me an impulse once lacking, to switch from surrealistic carving to figurative realism. I better get some new chisels, though. WOW, is really all that I can say, maybe all I really need to say. Beautiful, inspiring and an homage to the Creator! Thank you Chris. I appreciate you stopping by. Awesome Hub! Great pictures! Voted up, interesting and beautiful! Thank you for your comments and votes. I posted more of his work on YouTube and will include the link in the hub tomorrow. He is amazing without a pretentious bone in his body. I attended the meeting tonight and he told us that he is going to carve another full size crucifix for a church. I hope to put the process on video to share with everyone. These carvings are simply breathtaking! How beautiful and intricate and how amazing that you are working in this man's studio. I am sure you are very modest about your own work but I understand your timidity next to such a masterful carver. I enjoyed this hub and pictures! Voted up and interesting. That is amazing that you actually saw those stations of the cross last year. I'll tell Jorg about that at our meeting tonight. Thank you for the compliment but, but my carvings don't hold a candle to what Jorg Hummel can do. We were at woodcarving show and Jorg sat next to me. I was carving a "three minute" cat that we hand out to the kids. I was into 15 minutes of the three minute cat. When Jorg said he would like to try. In about 5 minutes, he carved this beautiful Persian cat that was a masterpiece by itself. Wow! I have never heard of this talented carver before but I saw one of the carving in the photos above, the terracuta station carving in Munich, Germany when I was in Munich last year. You must be a very talented carver. 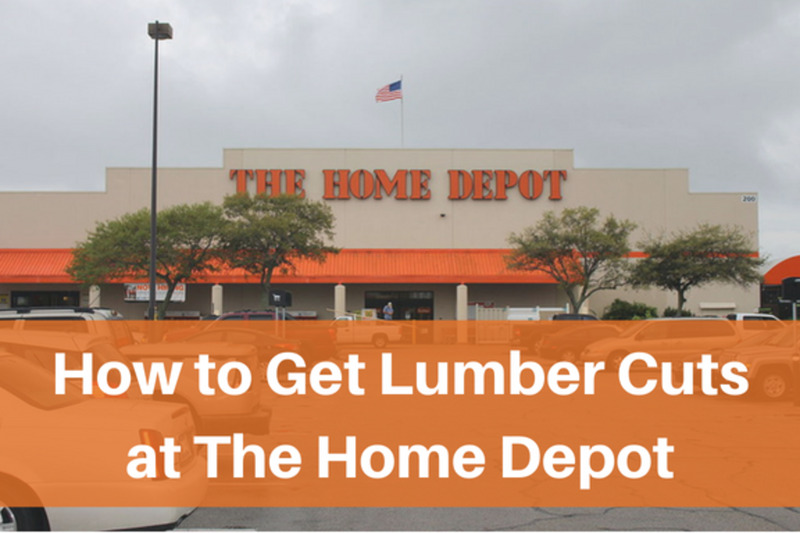 Thanks for sharing this hub. Take care. pagesvoice: Very well said. 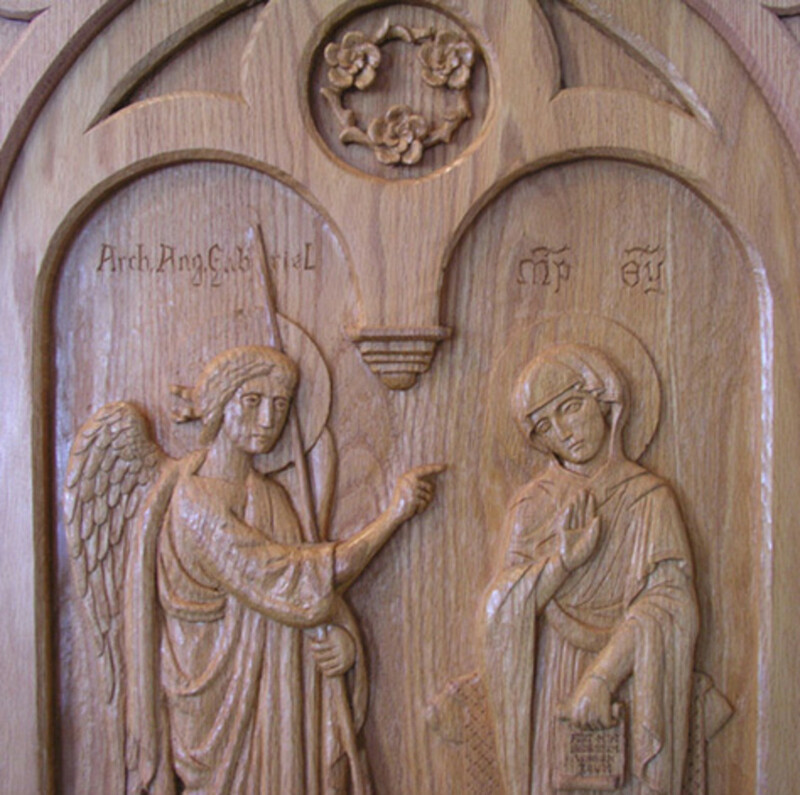 I have not been trained by him, but he does help us wit our carvings and I have learned a lot from him. I feel so honored and privileged to know a man of this caliber. Truly fabulous photos and artwork. You are do blessed to be able to do what you love. Voted up, awesome, interesting and beautiful. There are two circumstances when I feel the closest to God. One is when my hands are buried in soil planting flowers, trees, shrubs or vegetables and then reaping the rewards of my labor. The other time is when I am in my workshop smelling sawdust from a project I am working on. 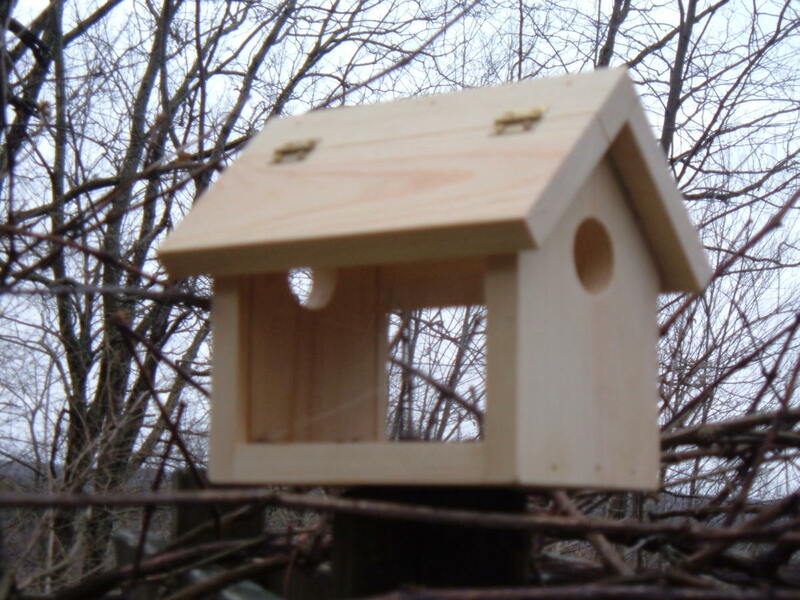 I have found that as I age the joys of life are by far much less complicated than when I was younger and the richness of the earth and building even a birdhouse is such a great feeling. You are certainly fortunate to have found and been trained by such a remarkable artisan.